Can Wind and Solar be significant contributors to a low emission electricity system? ...there is a substantial body of evidence that variable renewable integration costs are hugely dependent on the flexibility of the system to which they are being added. So claims a new report from a UK Energy Research Centre, which lists many studies after opining on them in The costs and impacts of intermittency – 2016 update. Integration costs are important and I'll write on some of the content of the UK paper in paragraphs below, but first I want to discuss the bias of the work, and a great accomplishment in Ontario. Taken together, the full range of impacts add weight to the message that electricity systems and markets need to adapt and be reorganised to incorporate large proportions of variable renewable generation most efficiently. systems and markets may not be what "need" to adapt. The key challenge facing policymakers, regulators and markets is how to ensure delivery of a flexible, low carbon system that makes maximum use of variable renewable generation whilst minimising overall cost and enhancing security and reliability. It is wrong to state a low carbon system maximizes "use of variable renewable generation." 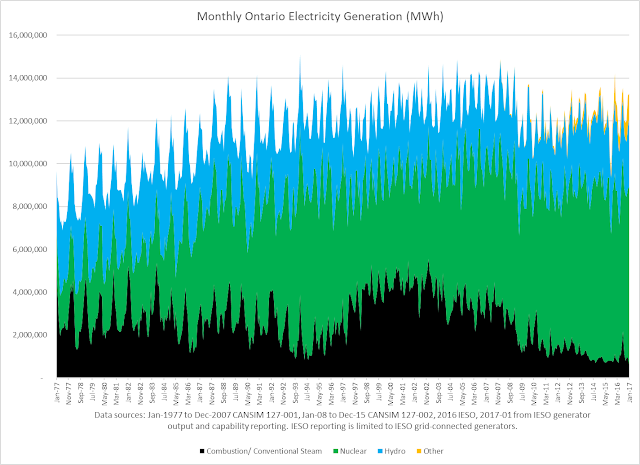 My estimates indicate in January - usually one of the highest demand months of a year - Ontario generated less electricity with fossil fuels than in any month since at least 1973. Probably the least of any month in my life (I was born the day Dylan shocked Newport with an electric performance). South Australia has been a vocal point for watchers of the renewables experiment - this story struck me as extraordinary in exposing the themes of a final tale everywhere low capacity credit supply is prioritized. Mr Weatherill's promise followed comments from Prime Minister Malcolm Turnbull earlier this morning, placing the blame for South Australia's blackouts entirely on the State Government. "It has created a situation where that state has the most expensive and least reliable electricity in Australia," Mr Turnbull said. "That is a fact. Of course they want to blame it on everybody else. "When they have the biggest heatwave there is no wind and when there is no wind, all of their windmills are not generating electricity. "They haven't planned for that."